At the Appliance Connection we install all makes and models of kitchen and laundry appliances. We have over 20 years experience, whether your replacing your existing appliances or installing new appliances in a new home , built-in, custom panel or ventilation, we do it all. With Licensed Techs, we are fully insured and TSSA registered and warranty all of our work. 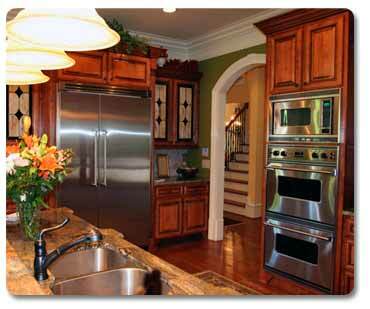 We also offer kitchen general contracting services and consulatations if you are planning a kitchen renovation. We know kitchens and are here to help. Based in Clarington, Ontario, we service all areas in Durham Region including Ajax, Clarington, Oshawa, Newcastle, Orono, Pickering, Whitby as well as Peterborough and the Kawarthas. We are your one-stop shop for all your appliance installation needs, so please call us today for a quote. © Copyright 2008 The Appliance Connection. All Rights Reserved.